Any dream team selection will always provoke controversy. There are so many great players and any selection will provoke argument based on the era that people remember best, the formation to be played, even club loyalties play a part. Still, those arguments have raged and the England Caps Dream Team has now been assembled to fuel more discussion. It has been decided to restrict the selection to the period after the Second World War as the information on players before WWII is so minimal, and teams changed personnel more frequently. The first and easiest position to fill. Gordon Banks, or ‘Banks of England’, as he was known, was the safest pair of hands in the country and his career was tragically cut short by the loss of the sight in one eye after a car crash. Peter Shilton had a longer career but Banks was there in 1966 and pulled off the most famous save ever against Pele in the 1970 World Cup. Why no David Seaman? Holland 1993, Germany 2000 and Brazil 2002 are the answers to that one. Kenny Sansom wins this, although Stuart Pearce, who took Sansom’s place in the England team, was very close. Although this is debatable, Kenny was dependable and more intelligent in his tackling, and his crossing was superior. Ray Wilson is another close call, a strong tackler who could also come forward and distribute the ball intelligently, largely because he started his career as a striker. Jimmy Armfield wins this one. Although now better known as a Radio 5 presenter, he was in the 1966 squad but then injured, so George Cohen (another contender) played in all the tournament games. Armfield was recognised as one of the best full-backs in the world after his appearances in the 1962 World Cup. Another close contender, surprisingly, as he is usually remembered for something different, is Sir Alf Ramsey, who gained 32 caps. Bobby Moore, the only England captain who has lifted the World Cup, and Billy Wright, who was first choice for twelve years (1947-59) and won 105 caps. Bobby Moore marshalled the World Cup winning defence, playing Alf Ramsey’s complicated but effective zonal marking system, and is possibly the only player who will appear in every single all-time England XI. 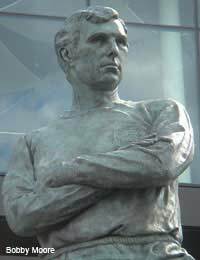 Billy Wright was the first player to amass more than 100 England caps and shares the record of captaining 90 matches with Bobby Moore. Bizarrely, although Wright is remembered as a centre back, he was originally a centre-forward, and gained the first 60 of his England caps at right-half, a right-sided midfield position. Duncan Edwards and Paul Gascoigne. Midfield is an area where England traditionally have many great players, but this combination matches the strength, speed and dependability of Edwards with the guile and audacity of Gascoigne. Edwards, tragically killed in the Munich Air disaster at the age of 21, had already been playing for England for three years and was judged by many to be the best English player ever, destined to match Pele, Best, Cruyff, Maradona and the like on the world stage were it not for his untimely death. Gazza, the mercurial talent, when fit and in control, played on the world’s stage and bested them, for example Lothar Matteus in the 1990 World Cup semi-final. There are so many players who have a shout in this category, Bryan Robson, Glenn Hoddle, Trevor Brooking, Johnny Haynes, David Beckham and Martin Peters to name just a few. Tom Finney takes this role, although to restrict him to the left wing would be folly. During his 79 caps, although left-footed, he would switch between left and right wings and come inside, such was his versatility was he. He scored 30 goals but created many more with his accurate crossing. However, he has to occupy left wing in this team, so that the right wing position can be filled by …. ... Stanley Matthews, the ‘Wizard of Dribble’. Matthews, a true all-time great, had no left foot to speak of and by his own admission, couldn’t head the ball. But he still mesmerised opposing full-backs and was supremely skilful at deceiving defenders at close quarters with the ball under complete control. Matthews wasn’t just recognised in England, he was the winner of the inaugural European Player of the Year award in 1956. Gary Lineker and Bobby Charlton occupy the two remaining positions. There are a lot of contenders here, Jimmy Greaves, Tommy Lawton, Geoff Hurst, Alan Shearer, Michael Owen and many more. Bobby Charlton simply can’t be ignored; although it’s denied by English sources, German sources agree that Bobby Charlton’s substitution in the 1970 World Cup quarter-final against West Germany was the change that allowed the Germans to overturn a two goal deficit and win 3-2, dumping England out of a Cup that they thought was theirs. Gary Lineker is the embodiment of the poacher; having the insight to be in the right place at the right time, he has scored more goals in World Cup tournaments than any other English player and took the Golden Boot for scoring the most goals at the Mexico 86 finals. So, to finish it off, who would manage this team? Sir Alf Ramsey is the obvious choice, after all, he did the business in 1966. Sir Bobby Robson came within two penalties of doing the same in 1990 (assuming we would have walked over Argentina in the final), and Sven-Goran Ericsson has a very good record on paper, but two factors need to be considered with regard to the Swede. Firstly matches that are lost on penalty shoot-outs are not considered to be lost matches, to statisticians at least, they are draws. The second point is that he lost (or rather drew, but then failed to qualify on penalties, if you’re a statistician) the critical games that lead to ejection from major competitions. Therefore it goes to Sir Alf, but feel free to disagree, as with any of the other selections in the England Caps Dream Team!